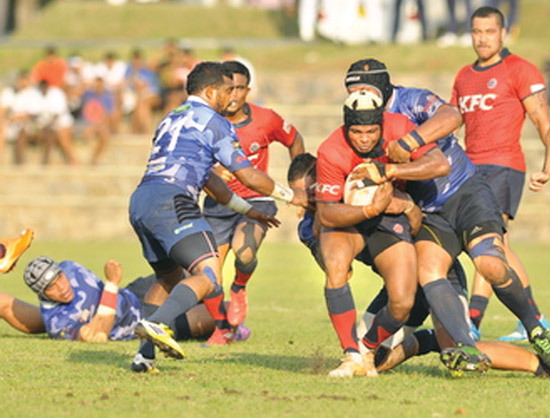 A CR player is well-held by a Navy defender with more opposition coming from Suranga Pushpakumara while CR’s Puppy Farrel comes to the assistance of his team mate. If the objective at the start of the season, one of many but the prime objective nonetheless, was to find the right team to defend the World Cup, then I’m afraid this was the season of littles. In one of the greatest fight-backs seen in a rugby match in the hill capital, Kandy Sports Club snatched victory from the jaws of defeat when they beat Havelocks Sports Club by 25 points (one goal, three tries, one penalty) to 24 (three goals, one penalty) in their Dialog ‘A’ Division League rugby match played at Nittawela yesterday.